As I sit here having just returned from the excellent Sherwood Archers Pie and Bean shoot, traditionally the last outdoor shoot in the Nottinghamshire calendar, I can reflect on yet another very successful year for Archery in Nottinghamshire. Participation is on the up and a it was great to see many new faces at the Nott’s league shoots this year, with record numbers shooting at all the competitions, this is an indication of the all the time and effort being put into beginners courses and coaching by individual clubs, well done to you all. Coaching in Nottinghamshire has benefitted greatly by the excellent work Mario our CCO has put into organising coach training courses. The County welcomes 8 new level 2 coaches who successfully completed their courses this August, and a new heavily subsidised level 1 course commences at the end of this year. Your County have decided to make the training of coaches a priority this year, especially for clubs who currently have no AGB trained coaches. To this end we have prioritised places on the subsidised course to clubs with little or no coaching resource in an effort to encourage a uniform coaching format and roll out of beginners courses. It is worth remembering that all coaching delivered by Nott’s coaches is on a purely voluntary basis and were it not for the all time and commitment given by individuals the sport of archery in this County would soon diminish, so again, thank you coaches for your efforts in delivering beginners courses and coaching sessions to all. The annual Nottinghamshire Archery Society winter training and development sessions are being held in Rainworth again and will commence in early December. 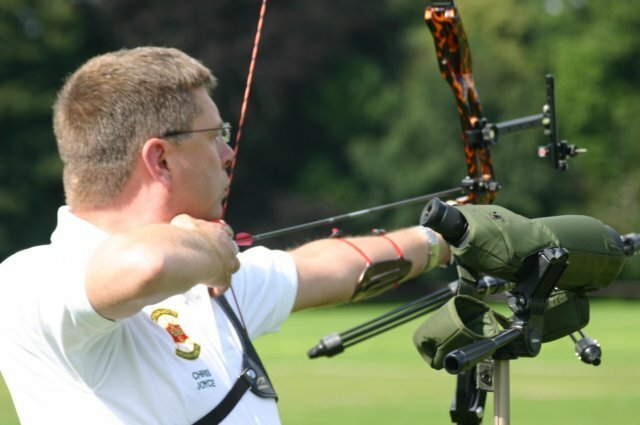 These sessions offer a fantastic opportunity for archers of all abilities to benefit from coaching by the best coaches in the County so book early to avoid disappointment, details are on the Notts web site. Those of you who went along to the National Series final at Wollaton Park could not have failed to be impressed with the high level of skill and talent shown by the competitors on what was a very windy day. It was great for Nottinghamshire to be chosen for this blue ribbon event and I am glad to report that Wollaton Park will stage this event for the next two years, and next year’s event should be even better organised with more trade stands and archery related stalls. So with the indoor season beginning it is time to put away the spotting scope and get out those big fat arrows ready for the precision shooting that indoor archery requires. I can’t believe that a year has passed since I took up the chairman’s role and I have enjoyed immensely the duties and meetings that have taken place this last year. Nottinghamshire Archery Societies success can be put down to having a strong active committee with good representation from all the clubs in the County, so if you are a Nott’s affiliated archer and feel you can contribute to the good work already in progress please come along to the meetings which are held regularly at the Bridge Inn at Oxton.